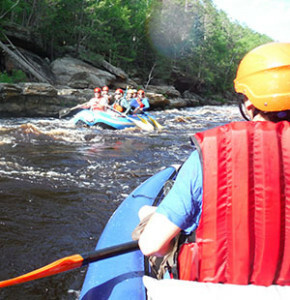 Designated “Scenic and Wild” the Kettle River is an exciting run for whitewater paddlers. Flowing through Banning State Park, the river gives a thrill to adventure seekers. Our run on the Kettle starts just above “Blueberry Slide” a long and tricky rapid to kick off the run. The fun keeps going as the Kettle squeezes into the gorge and rafters run “Mother’s Delight” and the “Dragons Tooth” tight and technical, keep paddling and don’t forget to check out the scenery. Next comes the “Little Banning Rapids”, lively and fun with a quick view of a Ghost Town. The trip finishes with a stop at Wolf Creek Falls and a slow float back to Robinson Park in Sandstone MN. Water Levels – the Kettle River is a protected free flowing river, the river goes up and down with the rain. At higher levels, big rafts are used, and when the river is running at lower levels we have inflatable kayaks (mini rafts.) If the Kettle River is above 3,400 cfs, trips will be postponed to a later date. 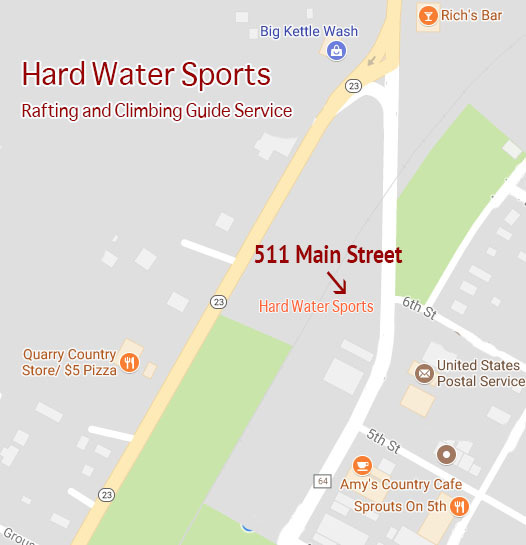 511 Main Street – we start with a shuttle ride from our guide shop in Sandstone, Minnesota to the head of the rapids in Banning State Park. The Float – from the Banning State park river access back to your where you parked in Robinson Park. Directions – Located just off interstate highway 35, roughly half way between the Twin Cities and Duluth. Follow highway 123 into the town of Sandstone MN, we’re located at the end of Main Street across from the post office.